If the Standard Black or Crystal White Playstation 3 consoles aren’t your thing, then maybe this will catch your interest. The shiny new color option (officially dubbed “Garnet Red”) will be available with the upcoming God of War: Ascension Legacy bundle scheduled for release on March 12th. Sure, you could just go out and buy Ascension on its own when March rolls around- but you wouldn’t just be missing out on a Garnet Red PS3. On top of the 500 GB system, the bundle will include Ascension, the God of War Saga (includes God of War I, II, and III, as well as God of War: Chains of Olympus and God of War: Ghost of Sparta), and a 30 day trail membership to Playstation Plus. The bundle is priced at $349, and it seems to be the only way to snag a Garnet PS3 in the US as of right now. 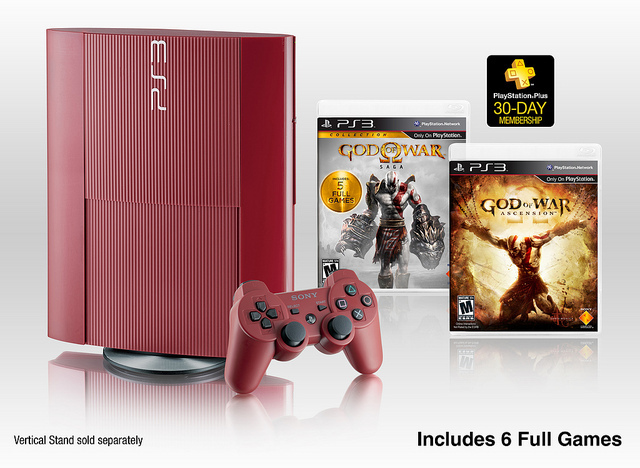 If you already own a PS3 and aren’t interested in any fancy new colors, then maybe the GoW:A Collector’s Edition will be more up your alley. It includes a copy of the game in a premium steelbook case, a digital version of the game’s soundtrack, a 6″ Kratos statue, a PS3 theme and avatar pack, 48 hour MP XP booster, and a pass for future DLC content. This will run you $79 in comparison. But wait- yes, there’s more! Preorder from Amazon and you’ll get the Mythological Heroes Multiplayer Pack. Preorder from Gamestop and you’ll receive the Multiplayer Pack, a poster, and a King Leonidas (of 300 fame) multiplayer skin. Altogether, it’s enough swag to shake a Blade of Chaos at. Of course, you also have the option of just picking up Ascension on its own March 12th for $59.99.